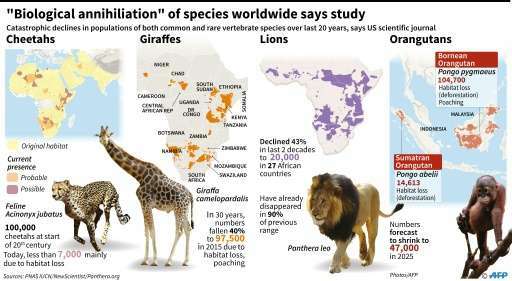 Most scientists agree that a "mass extinction" event is underway with the Earth's wildlife disappearing at an alarming rate, mainly due to human activity. Most life at this time was in the oceans. It is thought that the rapid, planet-wide formation of glaciers froze much of the world's water, causing sea levels to fall sharply. Marine organisms such as sponges and algae, along with primitive snails, clams, cephalopods and jawless fish called ostracoderms, all suffered as a consequence. The mother of all extinctions, the "Great Dying" devastated ocean and land life alike, and is the only event to have nearly wiped out insects as well. Some scientists say the die-off occurred over millions of years, while others argue it was highly concentrated in a 200,000-year period. An space rock impact is Suspect No. 1 for the extinction event that wiped out the world's non-avian dinosaurs, from T-Rex to the three-horned Triceratops. A huge crater off Mexico's Yucatan Peninsula supports the asteroid hypothesis.